Today's Disney Snapshot of the Day brings you a Magic Kingdom entertainment legend...Sonny Eclipse, artist in residence at Cosmic Ray's Starlight Cafe. Of all of the audio-animatronics in the Magic Kingdom, this space-aged alien reptile is perhaps one of the most well-rounded. He sings, plays his cosmic keyboard, tells jokes, and plays host to thousands of burger munching, ketchup slurping guests each day. You don't drift pass him for a few seconds as your ride vehicle turns a corner. He is not shrouded in darkness or back-lit with blue lights. He is well-lit, front and center on his stage at Cosmic Rays Starlight Cafe. He lays on the shtick pretty thickly, even by Disney standards, as he delivers a stream of bad puns and corny jokes in between his sci-fi themed songs. And if you take long enough to order your food and eat, you will be able to enjoy his act over and over, as his track loops every half-hour or so. 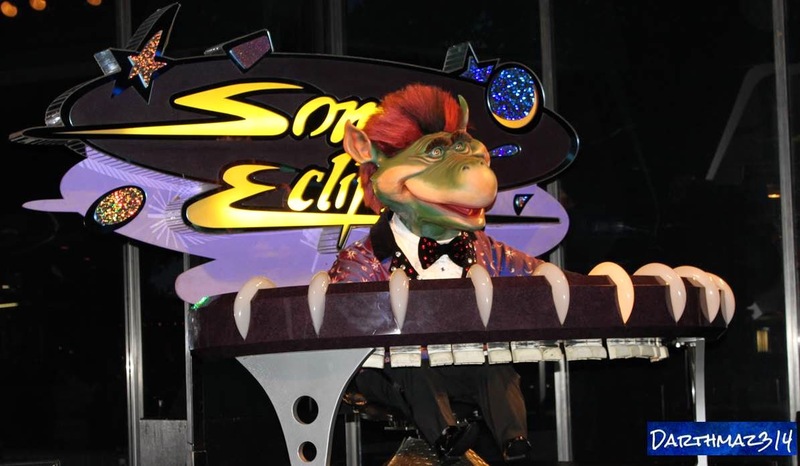 So here's to Sonny Eclipse, at Cosmic Ray's Starlight Cafe. He may not be housed in a legendary attraction, but he is a classic nonetheless.